It’s really ridiculous. I’ve had so much on my plate lately! But so have all the other high school seniors…but they haven’t been catering the desserts for parties, running a website, doing college applications, and been baking for way too many family occasions to count. So maybe I have been doing more than them. But whatever, I like it. Baking makes me happy. 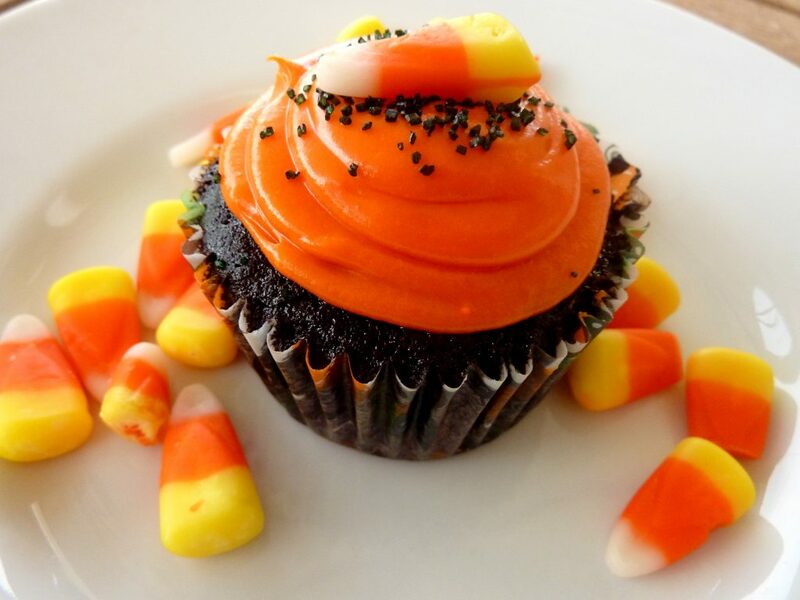 So, for these cupcakes, I wanted to do a red velvet cupcake but make it “Halloween-friendly”. Some black and orange food coloring later and I had “black velvet” cupcakes and orange cream cheese frosting – spooky, huh?! I made them in the cutest little Betty Crocker Halloween cupcake liners (see picture below; and thank God for Betty Crocker, right? She’s a goddess) and garnished them with some black sugary sprinkles and candy corns, the ultimate Halloween indulgence. Preheat oven to 350 degrees F. Sift together flour, cocoa powder, baking soda and salt in medium bowl. Set aside. Beat butter and sugar in large bowl for 5 minutes or until light and fluffy. Beat in eggs one at a time. Beat in sour cream, then milk and vanilla. Mix in food coloring until you've reached your desired color. Gradually beat in flour mixture on low-speed until just blended. Do NOT overbeat. Spoon batter into 30 paper-lined muffin cups, filling each cup 2/3 full. Bake 18 to 20 minutes or until toothpick inserted into cupcake comes out clean. Cool in pans on wire rack 5 minutes. Remove from pans; cool completely. Frost with Orange Cream Cheese Frosting. Have the cream cheese cold and the butter at room temperature. In a medium bowl, beat cream cheese, butter, food coloring and vanilla just until blended. Add sugar one-third at a time and beat just until smooth and the desired consistency. If frosting is too stiff, beat for few seconds longer. Do not overbeat. These look so yummy…… love them!!! I want those cupcake wrappers! I know someone who would go bananas for them! Theses look delicious, and you of course is gorgeous. How much vanilla do you put in? That was not listed. 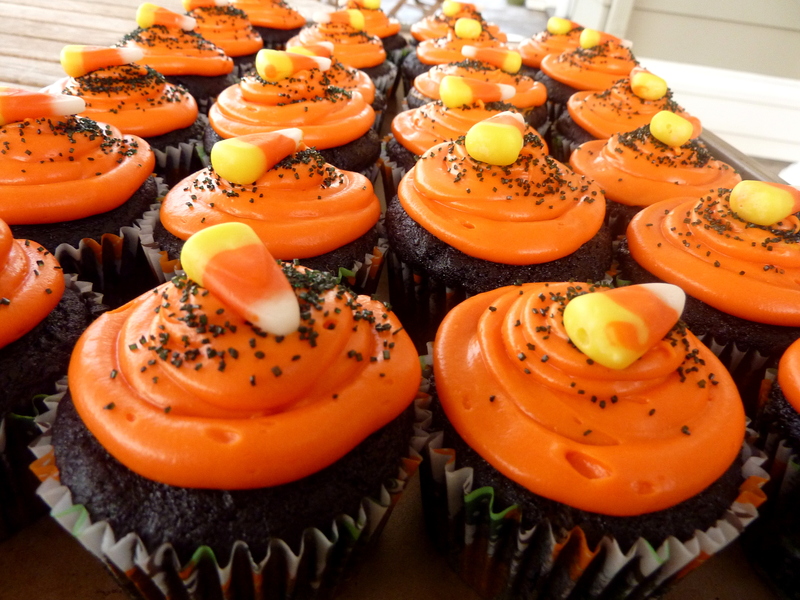 I am planning to make these for a kids halloween party and I just love the black velvet and cream cheese icing!!! Oops! Sorry, that should be updated now but it’s 1 teaspoon. Yep – sorry about that! Don’t know why this post has so many little mistakes! Haha…needed to proofread better. Oh, they look so cute and yummy. Never thought black color will turn out to actually look delicious. I hope your teacher enjoyed them. 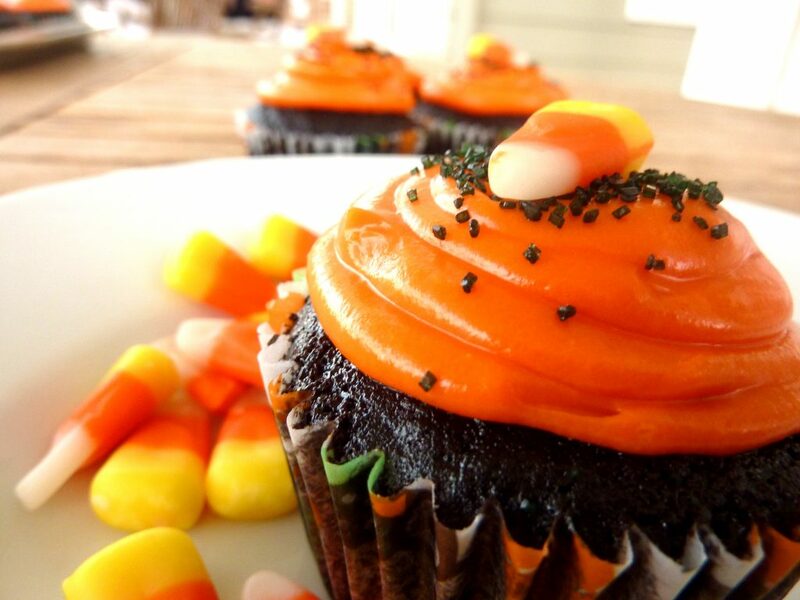 I am making these tonight for my block’s Halloween party! They sound amazing! These look incredibly moist and delicious! Can’t wait to make these at halloween!